Handylearn Counter is a popular productivity software, used since 2006 on classical feature phones and Symbian smart phones. The software replaces a tally sheet and is used for traffic census, election ballot counting or monitor animal population. The Android version enables you to share the result with e-mail or your favourite social network. Get it for free from Google Play Store. 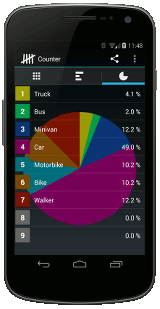 This entry was posted in apps and tagged Android, freeware, productivity by meier. Bookmark the permalink.